Dodgers officially sign Hector Olivera, Pablo Fernandez. 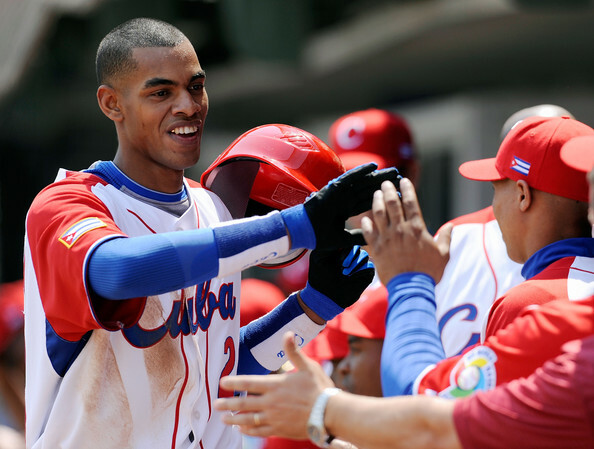 SAN FRANCISCO — Hector Olivera’s six-year, $62.5 million contract with the Dodgers became official Tuesday. The contract is believed to contain a team option for a seventh year (2021) for $1 million, which triggers if Olivera undergoes Tommy John surgery on his balky right elbow. Olivera, 30, will be 36 by then. Tuesday afternoon, he was en route the Dodgers’ extended spring training facility in Arizona before he is presumably assigned to a minor-league affiliate. In terms of years and dollars, Olivera’s contract represents the most significant commitment to any free agent the Dodgers have made in the Friedman era. He profiles as a second baseman or third baseman, both potential positions of need for the Dodgers after 2015. Howie Kendrick and Juan Uribe are both eligible to become free agents after this season, as is shortstop Jimmy Rollins. It’s not certain that Olivera can make an impact in 2015. He’s made only 273 plate appearances in Cuba (or any country) since 2011 because of injuries and his leaving the communist island. In his last full season, 2013, Olivera batted .316 and reached base at a .412 clip while hitting seven home runs in 73 games for Santiago of Serie Nacional. Olivera established residence in Haiti and received his visa eight days ago. The Dodgers also announced the signing of right-handed pitcher Pablo Fernandez to a minor-league contract Tuesday. Fernandez, 25, has a 32-30 career record with 40 saves and a 3.59 ERA in 177 games (21 starts) in seven seasons with Holguin (2007-14) and Matanzas (2012-13). According to a Dodgers press release, Fernandez the most All-Star votes in 2013-14 and earning both the win and MVP honors at the 2011-12 game. The 6-foot-1, 185-pounder had his best season in 2011-12, earning recognition as the Serie Nacional Pitcher of the Year with a league-leading 1.52 ERA and going 7-4 with 18 saves in 95 innings over 35 appearances with Holguin. That season, Fernandez closed out the first extra-inning no-hitter and third combined no-hitter in Cuban history with a 1-2-3 10th inning on March 13, 2012 to preserve a 1-0 win. Fernandez last pitched during the 2013-14 season, posting an 8-8 record with six saves and a 2.83 ERA in 27 games (one start). He issued only 10 walks in 57 ⅓ innings in 2013-14 and excluding intentional walks, he has issued only 87 walks in 414 career innings, less than five percent of his 1751 batters faced. Both Olivera and Fernandez agreed to terms with the Dodgers in March, but their contracts could not become official until they passed their physicals. To make room for Olivera on the 40-man roster, the Dodgers designated pitcher Eury De La Rosa for assignment. De La Rosa appeared in six games with the Triple-A Oklahoma City Dodgers, all in relief, and allowed five runs in 7 &frac13; innings. This entry was posted in JP on the Dodgers and tagged Andrew Friedman, Hector Olivera, Pablo Fernandez by J.P. Hoornstra. Bookmark the permalink.